For those patients that are missing all or multiple teeth, dentures can be an excellent way to help replace them. 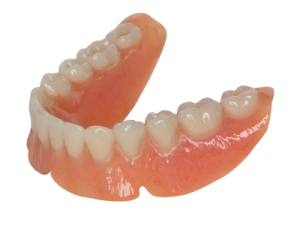 Dentures consist of porcelain or plastic teeth set in a pink acrylic material (the pink acrylic is used to replicate gum tissue that surrounds the teeth). A full denture rests solely on the edentulous gum ridges (and hard palate for the top denture). The acrylic and teeth support the lips and face as well as provide a surface for chewing and speaking. Most patients have little problems with their upper denture because of the “suction cup effect” it has onto the upper jaw. Lower dentures, however, do not have this suction cup effect and tend to dislodge more often from tongue movement and eating. In cases where the residual gum ridges have been lost (resorbed), the dentures can be supported by dental implants, creating much greater support and retention. If you are a current denture wearer and are unhappy, you’re in luck! With dental implants and the latest digital imaging, patients can now replace their removable dentures with permanent implant supported prostheses. This procedure is faster and easier than ever. For more information, contact us to schedule a consultation appointment to find out if this option will work for you. For those patients that are missing all or multiple teeth, dentures can be an excellent way to help replace them. A new set of dentures should last for 5-10 years before they need to be replaced. However, dentures do need to be relined periodically (once every year or two) depending on how quickly the gum tissue changes underneath the denture. Fabrication of full upper and lower dentures involves impressions, a few try-in appointments, followed by final delivery and an adjustment period. The entire process takes about 4-6 weeks.